Photo: VW I.D. Concept and Tesla Powerwall, the residential battery pack. This news is in regard to Tesla’s commercial batteries, called Powerpack. Electrify America, the Volkswagen subsidiary that’s tasked with building up America’s electric vehicle charging infrastructure ahead of VW’s plan to introduce a new lineup of electric cars, has made a deal to use Tesla Powerpack batteries in over 100 of its charging stations. The company will include 210 kW Tesla Powerpack batteries with 350 kWh of energy capacity, which will help mitigate Electrify America’s charging station power demand during peak charging periods, according to the company’s announcement. Buy supplementing with the energy stored in the batteries during busier charging periods, the company can avoid putting too much demand on the grid and ideally dodge any charges associated with that. The design is modular so that more energy capacity can be added in the future. The current setup will rollout to stations across the country throughout 2019. Electrify America’s charging source itself is capable of 350 kW quick-charging, which theoretically can juice up a car with 20 miles per minute, according to the company. The most common DC fast chargers are still just rated at 50 kW. Its fast-chargers will be spread out among 17 major cities and along “high-traffic corridors” in 42 states, with two cross-country routes planned. The Verge reports that 89 stations are already online, with a goal of building over 3,000 total. The Verge also reports that this is another feather in Tesla’s energy business’s cap, as Tesla Energy’s deployment of over one gigawatt hour of energy last year tripled what it deployed in 2017, and the company expects to reach over 2 gigawatt hours of storage by next year. 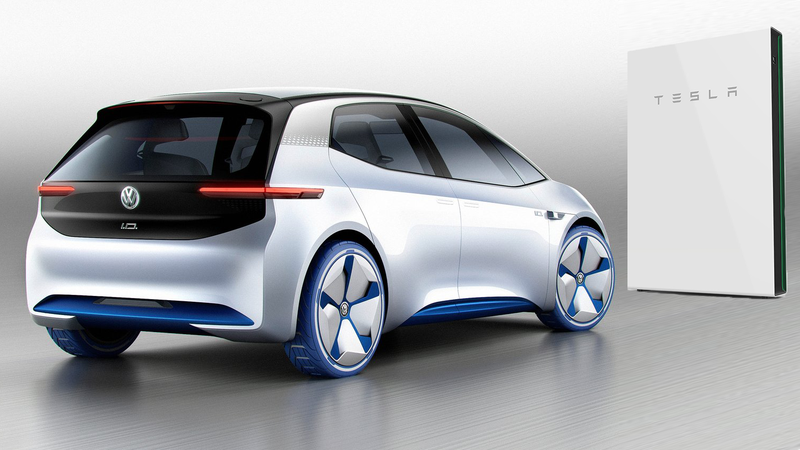 Volkswagen is also expected to reveal a production version of its I.D. hatchback, which is expected to be the first in a new lineup of mainstream EVs for which the investment in charging infrastructure makes sense. Correction: This article initially referred to Tesla’s batteries in this deal as Powerwall units, which is the name for the company’s residential energy units. Powerpack is the name for its commercial battery units.